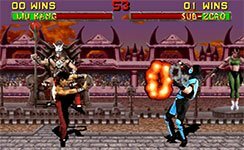 In the 90s if you wanted video game gore - then Mortal Kombat was where it was at, oh and the fatalities? Who can forget those? Oh and the graphics - by the standards digitised sprites were revolutionary, and gave the game that extra wow factor. Original MK arcade cabinets are sadly few and far between nowadays, but fear not - both the original and many of its sequels are featured on our multi-game arcade machines, so you can keep practicing your brutality finishes just like in the arcades.